Ikea is facing mass opposition from blog fans across the globe after it took legal action against a blogger, issuing a cease and desist letter to popular Ikea Hackers blogger Jules Yap. The blogger has also received support from a group of marketing professors, but Ikea says it’s just protecting its customers and intellectual property. Jules Yap’s Ikea Hackers blog has been inspiring fans since 2006 with modifications on and repurposing of Ikea products. “Hacks, as we call it here, may be as simple as adding an embellishment, some others may require power tools and lots of ingenuity,” the site explains. Many users in the social media debate have noted that the site uses a similar logo and colour scheme to that of the Swedish giant, but Ikea’s main beef with Ikea Hackers was that Yap had been profiting from advertisements placed on the site. Ikea initially demanded Yap relinquish her domain name but has since agreed to refrain from legal action provided she remove the advertising. Yap, a self-confessed ‘crazy fan’ of Ikea had started hosting advertising on the blog to supplement her income as it became more than just a hobby. She recently updated her blog readers on the situation, describing her disappointment in Ikea’s heavy-handed approach. “Needless to say, I am crushed. I don’t have an issue with them protecting their trademark but I think they could have handled it better. I am a person, not a corporation. A blogger who obviously is on their side. Could they not have talked to me like normal people do without issuing a C&D?” Yap wrote. “We very much appreciate the interest in our products and the fact that there are people around the world that love our products as much as we do. At the same time we have a great responsibility to customers, who should always be able to trust the Ikea brand. High quality and good service are essential elements of this. Another important aspect is that the many people want to know what really is connected to Ikea – and what is not. “For that reason the Ikea name and brand must be used correctly. When other companies use the Ikea name for economic gain, it creates confusion and rights are lost. The Ikea Hackers Facebook page has attracted a string of supportive comments from Yap’s nearly 135,000 fans. “Don’t they realise your site is actually helping their business? They should hire you!” Ola Velner posted. “Bad move, Ikea! 80% of the items I’ve purchased there over the past five years are due to something I saw on Ikea Hackers, not in their catalog,” Eileen Lola Brett posted. An onslaught of Yap supporters have posted to Ikea’s various Facebook pages around the world a generic message of disappointment. “These same corporations have PR teams scratching their f***ing heads for ideas on how to force their product on the world. Yet when it happens organically: the lawyers just decide, ‘Nope, shut ’em down’,” user FrustratingToWatch posted. “Why not invite her into the fold? Make her a part of the PR team, have a direct link from her site to the Ikea website… she could be paid by how much traffic her site pulls to Ikea’s site, or a stipend or something. It’s an idiotic way for the company go to about thing,” user OuisghianZodahs42 posted. “Silly move. 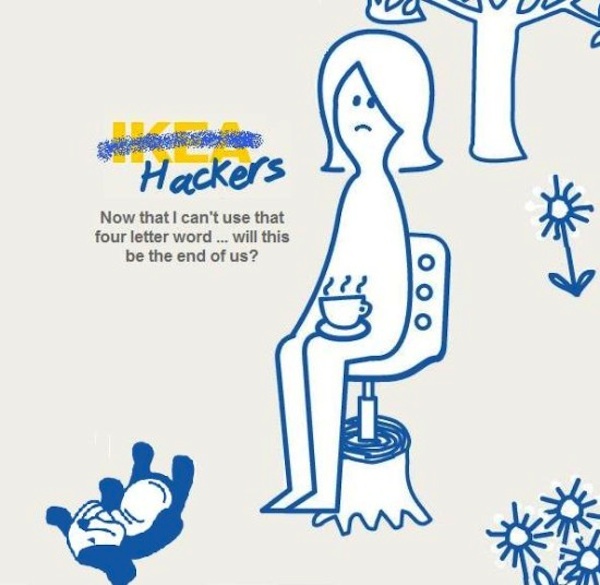 Ikea Hackers only promoted new ways to use Ikea products. It’s called marketing, which results in sales, and it was free… Ikea profits from the Ikea Hacker DIY culture. 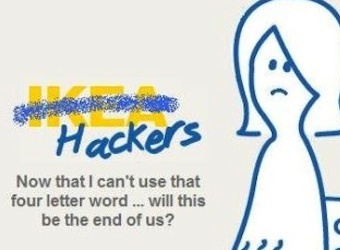 One can’t ‘hack’ IKEA without buying their products,” user unGnostic posted. “Ikea Hackers runs ads, and makes profit off the ads. Basically it’s profiting off the Ikea name,” user Kermityfrog posted. “Because they are using Ikea’s logo and branding all over it and it look like it is Ikea affiliated,” user FlappyBored posted. “It is not all black and white here… the ads are all advertisement for products made specifically for Ikea products but that are not made by Ikea. The Ikea’s competitors ads even reference Ikea products,” user Drudruisme posted. Ikea’s handling of the Ikea Hackers issue is reminiscent of similar heavy-handed grief Canberra-based blogger and Nerf Gun enthusiast Martyn Yang received back in 2012 from toy company Hasbro. Yang has ceased posting to his blog since receiving a string of accusatory and questioning emails from the company and a suspicious visit from alleged private investigators at his apartment. Hasbro demanded Yang reveal the sources that gained him access to new-version Nerf Guns that weren’t available in Australia, which he had reviewed on his blog. Yang quipped back recommending Hasbro conduct an online search rather than hassling a devoted fan. Both cases are good examples of the tightrope companies walk between protecting their intellectual property and nurturing their online fan communities.